The Advanced Condition Assessment and Pipe Failure Prediction Project (ACAPFPP) has won the Australian Business and Higher Education Round Table (B/HERT) 2016 Best Research Development Collaboration Award. B/HERT is a not-for-profit organisation established in 1990 to strengthen the relationship between business and industry and the tertiary education sector. Its members are leaders in tertiary education, business, industry and research institutions. The award was presented at a dinner held at the Crown Palladium in Melbourne on 15th November 2016. 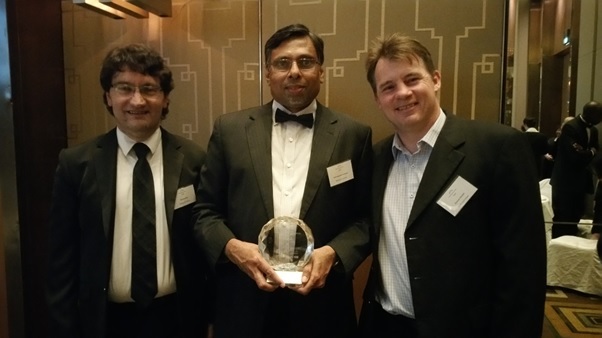 Shown displaying the award trophy are, from left to right, Thomas Kuen of Melbourne Water, Jayantha Kodikara of Monash University and Duncan Sinclair of South East Water. A close-up of the award trophy. Congratulations to all members of the ACAPFP Project!